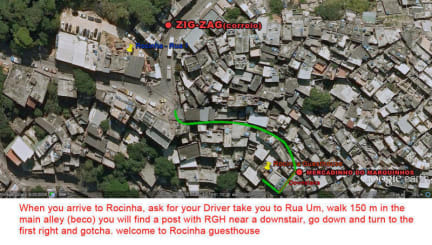 Rocinha Guest House i Rio de Janeiro, Brasilien: Reservér nu! There are only 2 rooms, giving you a home feel away from home. The first room has 1 bunk bed on the 2nd floor with a private bathroom, and the other room is on the 3rd floor with 3 bunk beds and a shared bathroom. Both have windows looking out to the amazing view below. We have a large patio area outside of the 'big' dorm upstairs where you can see the whole favela at night you can see stars above and below, or walk up to the next terrace and relax in our hammock space or use the BBQ! The house offers a fabulous view of Rocinha down to Sao Conrado beach. From the entrance of Rocinha, you can walk to the beach in 5 minutes! Great for surfing or just relaxing on the sand. There are moto-taxis working 24hrs to get you up and down the hill when you need or want, or you can always explore and walk down the windy main street, where there are always constant action and movement. There are markets, street vendors, pharmacies, restaurants, bars, and just about everything you can imagine in walking distance, plus various weekly community events offering Pagode, Samba, and of course Funk music. 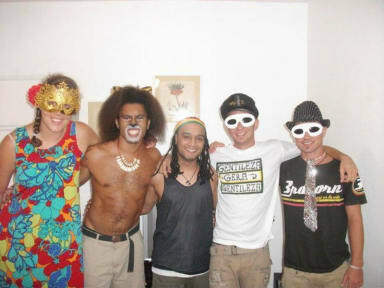 Staying in Rocinha, will give you an inside look into a new culture and way of life through this experience. The house members are portuguese speaking only oberdan speaks a intermediate english, so if you aren't great on your portugues skills, we suggest taking an intro portugues class. Ask for Mary or Rodrigo for more information or check out cariocafreeculture.com. Mary Ellen and Rodrigo are English speaking, and are just a phone call away if you need some translation help! 24hr reception, just ring the bell when you arrive. Currently no lockers, but the owner/mother of the house can lock up and keep your valuables for you until you request them back.